Intra-Operative PTH Assay: Exposing the Problems with Measuring PTH in the Operating Room. Measuring parathyroid hormone (PTH) in the operating room has some theoretical benefits, but in real life, the intra-operative PTH assay (io-PTH testing) doesn't really help and may hurt. Measuring parathyroid hormone in the operating room cannot determine if a patient is cured of hyperparathyroidism. Intra-operative PTH Assay: The theory of measuring PTH in the operating room (io-PTH). Since parathyroid tumors make parathyroid hormone (PTH), and it is the PTH hormone secreted from the parathyroid gland tumors that cause the symptoms and damage associated with primary hyperparathyroidism, then it makes total sense for the surgeon to measure the PTH in the operating room after he/she removes a parathyroid tumor to see if the problem is fixed. In theory, if you remove the PTH-producing tumor then the amount of PTH in the blood will go down. To say it differently, if the goal of the operation is to remove the source of the excess parathyroid hormone, then it makes sense to measure the hormone during the operation to see if the PTH level drops in the blood after the parathyroid adenoma is removed. Ahhhh, yes, but it isn't that simple. Many people with primary hyperparathyroidism have more than one parathyroid tumor and the PTH assay doesn't identify them. Quick History of Parathyroid Hormone Measurements. When I was a surgical resident between 1986 and 1991, it took us at least a week to get a parathyroid hormone (PTH) level on a patient. Individual hospitals did not measure PTH, we drew the blood, froze it, and shipped it to Dallas, Texas, the only Smith-Kline lab that could measure PTH in the country. Prior to 1985 we couldn't measure PTH at all, we were stuck doing dumb tests like 24 hour urine calcium tests (it is easy to measure calcium), and waiting for a patient to get kidney stones or break their bad-osteoporosis bones before we could definitively say they had a parathyroid tumor and primary hyperparathyroidism. By 1993 the technology was advanced enough to allow some hospitals to measure PTH levels, and some of these tests took only about 45 minutes (called "Rapid PTH Assay"). It was "rapid" because 45 minutes was fast compared to 7 days when we sent it to Dallas. This was only available at a few hospitals and it was costly and cumbersome. It wasn't until 2005 that the technology was cheap and widespread enough that most hospitals could measure PTH in less than an hour (at the cost of $1,200 per test!). Now in 2013, most hospitals can measure PTH in less than an hour. Parathyroid hormone (PTH) is short-lived. It has a half-life of about 4 minutes. Thus the attraction… we take out a parathyroid tumor, we wait 10 minutes (while you are still asleep on the operating room table) and then we draw your blood. During that 10 minute period of time, the PTH should decrease by a significant amount if the tumor removed is the source of the PTH that is in your blood. The tube of blood then gets labeled with your name, etc, and then it gets transported to the lab (5 minutes?) where it sits for at least 30 minutes in the reagents before it can be read on the machine. Provided all the humans involved are doing nothing else, we can get the answer in about 45 minutes (while you are still asleep). If the PTH levels drop by more than 50% (an arbitrary number that has been decided upon) then the surgeon becomes excited, sews up your incision and pronounces that you are cured of your parathyroid problem. Thus, it is impossible to perform a parathyroid operation using intra-operative PTH assay in less than an hour and 15 minutes… and that assumes your surgeon knew exactly where your parathyroid adenoma was located and found it almost immediately without much searching. PTH Assay: The Problem-There is Often More Than One Parathyroid Adenoma. It is absolutely true that removing a parathyroid adenoma (a parathyroid tumor) will decrease the PTH levels in your blood quite quickly. This would be the perfect surgical tool and the perfect cure if, and only if, people with primary hyperparathyroidism only had one parathyroid tumor. If everybody with primary hyperparathyroidism had one bad gland, and nobody had two or three (or rarely 4) bad glands, then measuring PTH in the operating room would be fantastic and it would absolutely tell us if the patient was cured. If there was never the chance of more than one bad gland, then we surgeons would take out what we believe is the bad gland then we measure the PTH and if it goes down the patient is cured. Fantastic! Unfortunately, this is not the case. About 30% of patients with primary hyperparathyroidism have more than one bad parathyroid gland that is contributing to their disease. Almost 100% of the time, the bad glands are not all "equally" bad-and one tumor is significantly bigger than the other(s) as you can see from the photos on the right. Almost always, it is the biggest of the tumors that show on the sestamibi scans for two reasons: 1) they are bigger and thus easier to see, and 2) they are bigger because they are older and are producing more PTH. It is the PTH production (the activity of the parathyroid tumor) that the sestamibi scan is measuring. If you are following along closely, you are seeing the problem: if the scan is positive, your endocrinologist will send you for an operation. The surgeon will take out the tumor that shows on your scan (the big one of course) and then measure your PTH. The PTH will drop by 50% and he/she will claim you are cured and send you on your way. Then you will note that your PTH is still high and your surgeon will say "it does that a lot of the time, there are research papers on this topic showing that about 20 to 30% of people have high PTH levels after their operation". Hmmm, do you see the pattern here? About 20 or 30% of people have more than one parathyroid tumor and yet this surgeon never looked at the other three glands. Endocrinologists should demand that their surgeons evaluate all four parathyroid glands. Patients should demand it! io-PTH Assays: More Patients Not Cured. Our practice is limited to parathyroid surgery only, typically performing just over 50 parathyroid operations per week. About 18% of our patients come to us after having an unsuccessful parathyroid operation somewhere else. Virtually all of them were operated on by their "local expert" who operated on them because they had a positive scan. Like a Greek tragedy, the sad story is the same every time: the scan was positive, the surgeon operated on that side of the neck and removed a parathyroid gland, measured the PTH in the operating room (io-PTH assay) and watch the PTH decrease by about 50% and stopped the operation. The surgeon told the patient and their family that the operation was successful. But within a few weeks it becomes apparent that nothing has changed. The calcium and PTH levels are exactly the same as they were before. Sometimes both the calcium and the PTH are a little bit better, but not perfect (the calcium is still above 10.2 mg/dl). This is when the patient is told things like "this may be normal for you". The problem is, folks, that the other three parathyroid glands have not been addressed. We can't say "this is normal for you" when the other parathyroid glands have not been addressed. So nearly 20% (one in five) of the people we operate on have had parathyroid surgery previously (are you still paying attention? -about 20-30% of people with hyperparathyroidism have more than one parathyroid tumor). If measuring PTH in the operating room doesn't work, then why is it used? The intra-operative PTH assay is typically used by less experienced surgeons who don’t have the skills to find all four parathyroid glands quickly, safely, and through a small incision. It isn't easy, and if it was, people would not come from all over the world to have us perform their operation. The reason we have a business is because finding all four parathyroid glands can be very difficult and has dramatic complications if the surgeon isn't an expert and doesn't do parathyroid surgery all the time. Thus, most surgeons take the easy route, which is ultimately much safer for the patient and in this regards, a good thing. If the surgeon may hurt the patient, then let's have as little dissecting as possible. The problem is, however, that the scans are often wrong, the PTH doesn't go down by 50%, and the patient has a surgeon operating on them with inadequate experience. There are plenty of surgeons who claim to be an “expert”, but all they will do is take out the one tumor that shows on a scan and not check the other four parathyroid glands—the same simple operation that the “non” experts at your local hospital will do. Intra-operative PTH assay is one of the biggest fibs ever thrust upon patients by doctors. It is important to understand this fact: If there is a fall in the PTH after removal of a parathyroid gland, it tells the surgeon that he removed a hormone producing tumor. THAT IS IT. But is DOES NOT tell if there is a second tumor still present. You can't tell if there is another bad parathyroid gland without actually checking them. The fall in PTH tells the surgeon a tumor has been removed, and that doesn't mean that the patient is cured. Two adenomas removed when the scan shows only one: Watch the 13 minute movie. If you watch the 13 minute movie of me performing a 4-gland parathyroid operation, you see several important things. 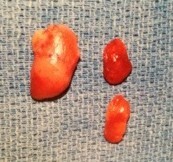 First, we look at all four parathyroid glands in all patients, and this is done through a 1-inch incision. This patient had a scan that showed one large tumor, and yet we found a second smaller tumor on the other side. His intra-operative PTH test would have dropped by 90-95% but he would not be cured. He would have continued to have high calcium and PTH levels (but lower than before). He would need a second operation within a year or two. We measure PTH different than everybody else. We measure it as it is being released from the parathyroid glands themselves (we do not measure the PTH from the blood). Note that we take a very small biopsy of the parathyroid glands and we measure the amount of radioactivity the biopsy contains (note: it is standard to biopsy all the normal parathyroid glands-it is supposed to be done in all parathyroid operations, not just when using our method of PTH testing). The computer can determine (off camera) how much PTH that gland is producing (corrected for weight of the biopsy). There is a standard curve established and from that we can tell if a parathyroid gland is 1) over producing hormone, 2) dormant producing nearly zero hormone. This is the perfect method—it tells you what each gland is doing. However, this is not widely used because it requires the surgeons to find all 4 parathyroid glands which typically takes someone 2-5 hours to do. So, they take the easy route—they get a scan and typically operate only on people with a positive scan. They remove the one tumor and measure the PTH. If the PTH goes down then they know they removed the parathyroid gland that showed on the scan and they quit the operation. About 25% of people getting this procedure are not cured. They have a second gland that is diseased and it has not been discovered. Nearly 20% of the operations we perform are on people who had this type of operation previously. We evaluate all four parathyroid glands. There is no way to determine if a second parathyroid gland is bad (over producing hormone) unless you look at all of them. This is why surgeons spend so much effort on getting scans. Their intention is to: 1) get a positive scan, 2) operate to remove the parathyroid that shows on the scan, 3) use intra-operative PTH test to see if the PTH drops by 50%, 4) quit the operation. Since we do not rely on any of this, and we examine and test all four parathyroid glands, then we do NOT care if the scan is positive or negative. A positive scan does not save us even 10 seconds in the operating room. The goal is to cure the patient. The goal is NOT to remove the tumor that shows on a scan. Those two goals are not the same. One goal is MUCH easier to achieve than the other. Most surgeons will take the easy route and take their odds that you are one of the 75% that are cured, and if you are not, then you can have another operation some time later on another tumor (that may or may not show on another scan). Video of 4-gland parathyroid operation in less than 13 minutes. Related blog on "How to tell if your surgeon is cheating". 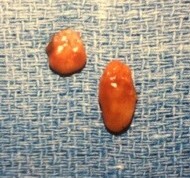 Related blog on "Failed parathyroid surgery".